There are numerous digital photoframe apps on the market. Most of them are not useful for seniors and do not stimulate family, friends and caregivers to keep sharing photos. This article describes 11 guidelines for designing better photoframe experiences. Seniors love to make video calls with their families. In fact, our research shows that this is one of the primary reason why seniors want to learn to use modern technology. When the family members are not available for a live video session (synchronous communication), seniors still love to see photos of what their family members have experienced (asynchronous communication). Seeing those photos can make seniors feel less lonely and can provide a starting point for a conversation. To create a digital photoframe experience where caregivers can share photos remotely, one can use the standard iOS/Android photo app and a shared folder via a cloud service. 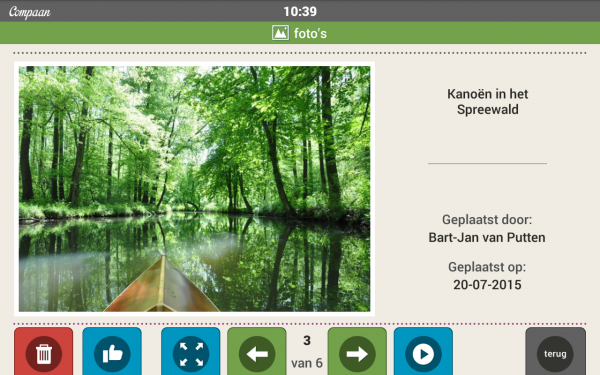 There is also an Android photoframe app developed specifically for seniors by the Dutch start-up Familie-LinQ. Furthermore, Asina and Compaan are examples of tablets for seniors that include a photoframe app. Many informal caregivers have started to use photoframe apps with their (grand) parents. Unfortunately, a few months later most of these photoframe apps are no longer in use. The caregivers have wasted their time and money, the seniors are still lonely and the product developers are unsuccessful. This article aims to help developers by describing 11 guidelines for designing successful digital photoframe experiences for seniors. A screenshot of the photoframe app on a Compaan tablet. This is a no-brainer, but we have tested numerous photoframe apps and the majority of them have major problems. One problem is that some apps only read-in all photos when the app starts. When photos are added to the library while the app is running, those will only be shown after the app has been re-started. Many seniors however only use their tablets as a photoframe and never re-start the app. Thus, new photos are never shown. Another problem can occur when the app loads photos from the internet while a slideshow is running. If a photo does not load quickly enough, the app should continue to show other photos or hold on to the current photo a bit longer. We have seen multiple apps though that either crash completely or that stop playing and never continue. Some seniors may want to quickly glance at the photos while others may need much more time because they want to study every little detail, they have a visual impairment or they need more time to understand what they are seeing. Therefore, it must be possible to change the playback speed. Depending on your specific users, you may offer these controls to the users themselves. Usually it is sufficient to have the caregiver control this remotely through a configuration interface. Whenever the senior sees something she wants to look at more carefully, she should be able to pause the slideshow by herself. Of course, it should be possible to continue to play the slideshow afterwards. In that case, the slideshow must continue from where it paused. Otherwise, the senior may soon be complaining that she sees the same photos over and over again. You must create a dedicated button for play/pause because most people will not expect the photo itself to be a button. The slideshow should not start playing again by itself. Paused means paused and playing means playing. That is predictable behaviour, which users can understand and remember. If your audience consists of users with very low computer literacy, you may skip this feature. Whenever the senior wants to use the photoframe in a more active way, i.e. on her lap rather than on the bookshelf, she may want to be able to swipe to the next photo. Swiping has become a pretty common gesture, which most seniors without cognitive impairments can learn quickly. Therefore, you do not need to create a dedicated next button, but if you have sufficient screen space it would not harm either. After a swipe, the slideshow engine should reset the time counter and continue playing. Thus, a swipe must not be interpreted as a ‘swipe and pause’ command. That would not be the behaviour which most users expect. We do not recommend a ‘backwards swipe’ feature, because it may leave users wondering what happens next. Will the slideshow pause, will it continue to play and show the photo from which we swiped backwards, or will it continue to show a new photo? If your app allows the senior to pick a set of photos before starting the slideshow (i.e. if it is not completely random), it must be clear how the senior can go back from the slideshow to the selection screen. You must include a dedicated button for that. The photo itself must not be used as a button and certainly not for quitting the slideshow. Nobody likes to watch the same TV show everyday or hear the same songs on the radio everyday. Similarly, seniors want to see new photos frequently. As most caregivers do not live with the senior in one home, there must be a possibility to share photos remotely. Web applications are usually most practical for sharing batches of photos, while mobile applications are most practical for sending photos almost instantly after they were taken. Therefore we recommend developers to offer both an interface for people who sit behind their desks and for people who are mobile. A responsive website may prevent you from having to develop two separate systems. Not just for sharing new photos, but also for changing the settings of the photoframe app, it will be very helpful if the caregiver can do this remotely. Therefore you should develop a user interface specifically for the caregiver (or for the senior if she wants to change settings and organise photos by herself). Do you remember the old days when people used to show each other photo books? The photo taker used to explain what was shown on the photos. Photoframe apps however are mostly used in absence of the person who took the photos. Thus, when a senior looks at the photos, she may not understand what she sees. This becomes especially hard when photos are shown in a random order, when they are shown too quickly, or when the senior suffers from cognitive decline. Therefore, whenever the caregiver shares a photo, she must be able to add a caption and be stimulated to do so. Ideally, captions are structured in terms of people (who), location (where) and activity (what). Your application will only make seniors truly happy when they can share their happiness. When the senior sees a (new) photo she must therefore be able to provide some feedback. An easy way is to include a ‘like’ button in the form of a smiley or thumbs up, which should trigger a notification at the caregiver’s side. For seniors with a higher computer literacy it may be desirable to be able to reply with a short text message. Sometimes, seniors do not like to see a certain photo. A photo of a person who passed away may e.g. invoke grief which is not desirable at random times throughout the day. People sometimes also do not like to see photos of snow or Christmas in summer. You could implement a ‘dislike’ button, which allows the senior to prevent a photo from being shown again by herself, or a notification is sent to the caregiver who can then deactivate the photo via the configuration interface. Show multiple photos in a row from one album, to allow seniors to better understand what they are looking at and to ‘get in the mood’ for the theme. Do not play the entire album however. Show newer photos more frequently than older photos. Show ‘liked’ photos more frequently than other photos. Show photos from a similar time of the year, e.g. show photos of Christmas 2014 during Christmas 2015. Show multiple photos in a row with the same people, objects, or activities. Even when there is a way to send photos easily from a mobile phone, caregivers may forget to do so, or become discouraged when the senior does not use the ‘like’ button to send feedback. When caregivers stop sending photos, seniors will see the same photos over and over again and will likely get bored. Research by Kimberly Snoyl shows that seniors may even become more lonely than before, because the forgotten photoframe becomes a proof that the senior herself is forgotten. Therefore, you should develop a mechanism to trigger caregivers to keep sending photos, week after week, month after month. Create a way to automatically synchronise an album on the caregiver’s phone with the photoframe. Send a reminder to the caregiver when she has not sent a new photo for let’s say three days (should be changeable by the caregiver). Allow multiple caregivers to share photos and see and comment on each other’s shared photos. Show statistics: how many photos did caregiver A send, versus caregiver B? Incorporate a financial incentive in your business model. When caregivers normally pay €15 per month, they will pay €0,10 less for each photo they send, with a minimum of €10 per month. This way, active users, who create better user experiences and thus improve your brand’s reputation, will get a better deal. Although there are numerous photoframe apps on the market, only few get the user experience right. Whether you stick to these guidelines can make the difference between a successful product and a product which will never see the light of day. Some photoframe apps are acceptable in the beginning, when both the senior and the caregiver are still excited about the new possibilities. However, if you want to make your product successful in the long run, you must make sure that your design stimulates caregivers to keep sharing new photos. Design guidelines allow you to build upon the experience of other designers and to produce a good initial design more quickly. However, they can not replace feedback from real users. Therefore, we recommend you to test every design with at least a few potential users. Need support? Please contact us.